Immediately, The Last Broadcast succeeds on two fronts. First, the movie does a good job of building suspense and mystery with its narrative. Unfortunately, it also manages to completely destroy the buildup with one of the most nonsensical endings ever put to videotape (yes videotape, this was not recorded on film). The Last Broadcast begins interestingly enough. It is a found footage movie from the late 90s, but whereas The Blair Witch Project aimed for authenticity, it is clear that this film is manufactured with subpar sets and costumes, typically of news reports and police officers. The premise is perfect for a horror/mystery movie. A group of people venture into the woods, only one comes out. The others (expect for one) are found brutally murdered. The lone survivor is charged and tried for the murders. All the evidence presented in the film points to the character Jim (the survivor). We the audience know (or should know) that he did not commit the murders, so the real intrigue begins as the creator of the “documentary” begins picking apart the evidence piece by piece, slowly demonstrating that Jim could not have been the killer. In my opinion, the movie functions quite well to this point. You relate to the characters and want to discover who, or what, caused these murders. Then, the entire movie crumbles with its twist ending. Skipping a few details, we learn that the person making the documentary, the person providing the voice-over, is in fact behind the murders. This on its face is not a particularly bad twist, however the execution is awful. 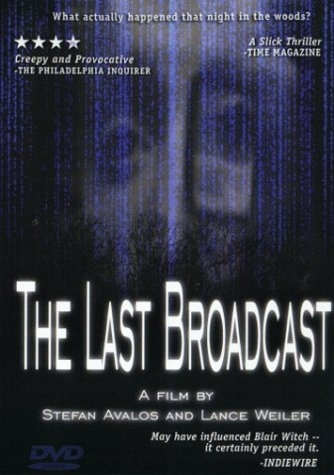 The Last Broadcast bizarrely switches to a standard third-person perspective after the killer’s reveal, moving the film from a found footage to a standard format. It is unexpected to move from first-person perspective and interview format throughout the film, to seeing the killer holding a camcorder and speaking into it. This ruins the movie by completely pulling the viewer out of the experience of the found footage format. Overall, I thought the film had an interesting premise and a decent buildup, but the entire thing falls apart with the ending. This entry was posted in Movies and tagged Found Footage, horror film, horror movie, Jersey, Last Broadcast, Movie Review, Weekly Screening Write-Up. Bookmark the permalink.